One of the finest pitchers in the rich history of Miami baseball, Joe Grahe etched his name prominently in the Miami record book during his three seasons at UM after transferring from Palm Beach Junior College. Grahe, who came to UM from Lake Park, Florida, still holds the school record for complete games (11 in 1988 and 10 in 1989) in a season. Grahe also remains the all-time UM career leader in strikeouts with 433 and his 34 career victories still ranks eighth in UM history. Grahe pitched 23 complete games in his UM career, second all-time. His 460.2 innings pitched also is the most by any hurler in Miami history. Grahe set a school record that still stands with 194 strikeouts in the 1989 season, a season in which he set a new school record for fewest hits allowed by a starter with 124 and allowed only 64 earned runs. Grahe was the 1989 NCAA Eastern Region Tournament Most Valuable Player. 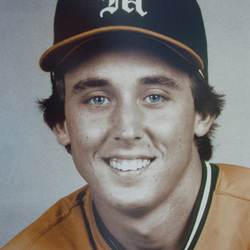 Grahe was a second round draft pick of the California Angels in 1989.